Bernies Boats and Motors Inc.
Bernie's Boats and Motors is an authorized Yamaha outboard dealer that can custom rig any boat to your specifications. Our staff is factory trained and offers personal service earning us Yamaha's Flagship Customer Satisfaction Award. Bernies Boats & Motors Inc., is a boat dealership that has been in business since 1952. We sell and service Desperado, Veranda, Xpress, and Freedom Boats lines. In addition to sales and service of boats, we are an authorized sales and service for Yamaha outboard motors. Each member of our professional staff is passionate about boating and fishing. And every day, we work to provide the finest sales and service experience for you, the customer. 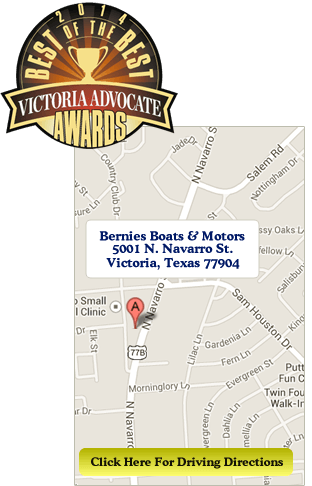 Bernies Boats & Motors is located at 5001 N. Navarro St. in Victoria, Texas.